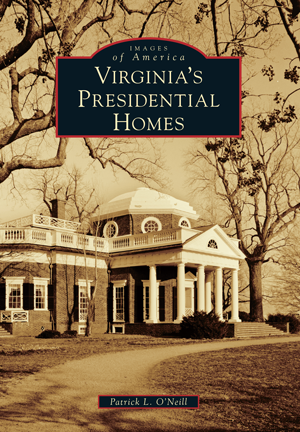 Images of America: Virginia's Presidential Homes takes a visual excursion to the homes of the eight Virginia-born men who served as president of the United States: George Washington, Thomas Jefferson, James Madison, James Monroe, William Henry Harrison, John Tyler, Zachary Taylor, and Woodrow Wilson. Virginia, nicknamed the "Mother of Presidents," is the birthplace of these eight men who were key to the success of the American Revolution, the forming of the U.S. government, the War of 1812, the annexation of Texas, the Mexican-American War, and World War I. Coming from diverse backgrounds and classes, their residences ranged from simple wood-frame structures to elegant, brick-pillared mansions and estates. Through images and drawings, this book will bring to life their homes and family life. Author Patrick L. O'Neill is a professional historian and archaeologist, and he is the president of the Archeological Society of Virginia. He conducts research in the Virginia and Washington, D.C. region with projects including an overseer's house at George Washington's Union Farm near Mount Vernon, a well in the basement of Arlington House, the truncated 1785 foundation of Virginia's State Capitol, Kittiewan Plantation in Charles City County, and Confederate graves at Bristow Station.